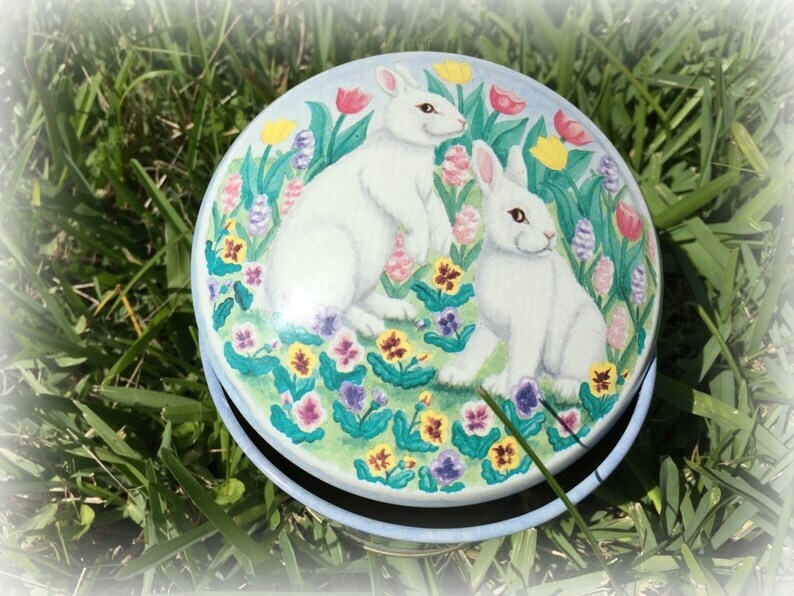 A lovely cottage garden scene adorns this collectible candy tin on a blue background with white rabbits, a black and white rabbit and a brown rabbit. It is adorned with springtime flowers including pink and yellow tulips, yellow and purple pansies, a white picket fence, a birdbath, birdhouse, park bench, a red cardinal and other birds. Very colorful and pretty! The metal lid features two white rabbits with pink ears sitting in a lush garden in full bloom filled with beautiful tulips, hyacinths and pansies. The lid is completely removable. This vintage Easter tin from the 80’s can hold bunny treats, cat treats or human treats! It is a collectible tin made by Meister in Brazil. It could also be used in a bathroom or baby nursery to hold cotton balls or swabs and would make a cute baby shower gift. Fill the tin with homemade or store-bought goodies such as cookies, biscuits, mini muffins or Easter candy and place it in a child's Easter basket, and any child will be delighted to have it. 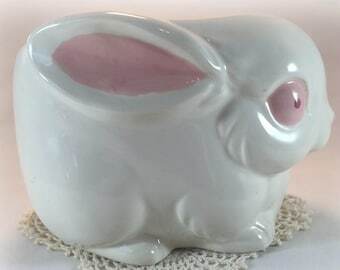 It would also be a great teacher's or office gift for Easter for someone who appreciates vintage items. 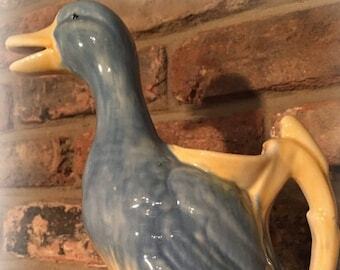 It can be used year after year as a cute Easter and springtime decoration or added to a vintage tin collection. ● Size: 3 3/4" tall, Diameter of lid is 4 1/2"
● Condition: Very good vintage condition. When looking at the box and lid very closely, a few very tiny scratches can be seen along with a few tiny dents. I had to really search to find the flaws. The lid has a small dent on the outer edge (please see photo). A few minor scratches and dents on the inside - keep the tin filled with candy or other goodies and you won't notice the scratches inside! 🐰 QUESTIONS: If you have any questions about an item that have not been answered here or in "Frequently asked questions" below, please contact me before purchasing.